Your low hum of a headache is now fully blaring to where it is the only thing you can focus on. You look at the clock and realize its only 9AM. You’ve already taken 4 pills to help, and it’s only getting worse. You feel stuck. You get these headaches all the time, and nothing seems to help. All the headache medicine you’ve ever taken doesn’t work, so what is causing this pain? Something a lot of people don’t know is that chronic headaches can often come from your jaw. A strained, misaligned jaw can lead to a myriad of problems; could it be the source of your headaches? Dr. Greg Friedman wants you to know a little more about your TMJ in Scripps Ranch, and how treating it could be the solution you need. Due to the joints’ location, it’s very easy for the strain in your jaw to radiate to the adjoining muscles. This is why traditional treatments for chronic headaches do not work: they are not fixing the source of the problem. If you are experiencing any of these symptoms, it can be nearly impossible for you to address them on your own. Fortunately, Dr. Greg Friedman can help. Because TMJ pain can be caused by a number of factors, treatment is just as varied. If your TMJ pain is caused by the jaw not being able to close properly due to the teeth being out of alignment, orthodontic treatment may be the best approach. One of the most effective treatments utilizes something called an occlusal splint. This is a small oral device that you would wear whenever you sleep to place your jaw into a more comfortable, natural alignment. This splint would not only allow your joints to heal, but would also place a physical barrier between your teeth if you grind them. This, along with physical therapy, can help address the source of your discomfort and completely eliminate it. The solution to your long term pain could be a small, easy to use mouthguard that is custom-made just for you. 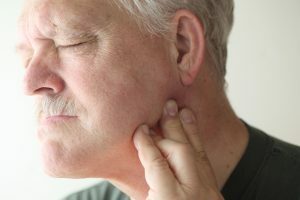 Most people experiencing TMJ pain haven’t even heard of the “TMJ” before, which is why they try many other approaches to treatment before seeing their dentist in Scripps Ranch. If you are experiencing any of the symptoms listed above and haven’t been able to get relief, it’s time to call Dr. Friedman. He is specially trained in neuromuscular dentistry that treats this exact array of problems. One quick visit could be all you need to answer your long standing questions and take away your pain. If you’d like to know more about how to spot issues with your TMJ, or want to schedule an appointment, simply call us today.